Dance of the Banished is definitely a worthwhile acquisition for middle and high school library collections; it will complement other works focusing on the story of young people affected by war-time, including The Diary of Anne Frank, provide a very accessible perspective on life in one of Canada’s First World War Internment Camps, as well as introducing readers to the story of the Armenian genocide, an event with which many young Canadians might not be familiar. “…Zeynep, fierce and bold, and Ali, caring and principled, live in the same village in Anatolia and plan to marry. Unexpectedly, Ali is sent to Canada and Zeynep is left behind. Each writes in a journal for the other, but as war comes to both countries it is unlikely their words will ever be shared. Still, they keep on. Zeynep writes an eyewitness account of the genocide from the point of view of the Alevi Kurds, telling a little known side of this tragic story. Ali, in turn, gives an accounting of life in an internment camp in, surprisingly, Kapuskasing. For each, the journal entries are a coping mechanism, a way to bear witness to the atrocities of war and ultimately, to bring justice. “…Although the story is fictional, “it is based on real historical events,” award-winning Canadian author Marsha Forchuk Skrypuch writes in her ending “Author’s Note.” What happens to the lovers, their families, their homeland, demands and deserves far more attention. Both Zeynap and Ali are Alevi Kurds, an ethnic minority about which is little known in the West. They are Kurdish, not Turkish; they are not Muslim, they are Alevi, “a 6,000 year-old religion that originated in Anatolia. Over the centuries Alevism has incorporated aspects of other religions,” Skrypuch explains. Already the author of five titles “set during the Armenian Genocide,” Skrypuch elucidates how “in all that writing and research, [she] completely missed an outstanding instance of bravery: the rescue of 40,000 Armenians by the Alevi Kurds of the Dersim Mountains.” Five years earlier, Skrypuch learned about a hundred “enemy aliens” living in her hometown of Brantford, Ontario, who were rounded up in the middle of the night on false charges, jailed, and sent to prison camps. “Dance of the Banished is based on true accounts about Alevi Kurds who were victims of war in Anatolia and the Canadian government’s internment camps in Ontario during World War I. The novel sheds light on the subtleties of cultural groups within geographical regions and their fate at the hands of the more powerful…. 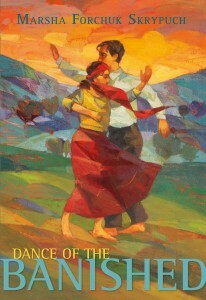 “Dance of the Banished is the story of Ali and Zeynep, two Anatolian (Turkey in the modern day) teenagers. Ali immigrates to Canada just prior to World War I and Zeynep, feeling abandoned at first, ultimately decides to embark on a journey to reunite with Ali. Parts one, three and five of this story are told through Zeynep’s written letters that are infused with her love for Ali: ‘[every time I take a breath I think of you. Every time my heart beats, I think of you’ (54)…[T]he historical details that make this story interesting cannot be overlooked. Parts two, four, and six of this story relate Ali’s experience as he immigrates to Canada. Initially, Ali does have a job, but as war breaks out he is branded ‘Turkish’ and interned at a camp in Kapuskasing as an enemy of Canada. Eventually, Ali and Zenynep are reunited, but not before each experience the hysteria of war and discover their own inner strength and will to survive.